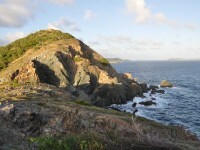 We made to Virgin Gorda around 11 am on Saturday, November 15th. The trip log showed 1499 nm when we anchored at Gun Creek to check in with the BVI customs office, and 1500 by the time we made our mooring at the Bitter End Yacht Club. We were fortunate to have a safe first ocean passage with very modest winds for the duration. The biggest frustration was the wind was almost exclusively forward of the beam for the entire trip making for a long windward slog at times. We had no no serious equipment failures, although the loss of the autopilot half way through made it a bit more awkward to grab food while the off watch crew was sleeping, but with the sail plan balanced we were still able to do so by locking the wheel and watching our heading stayed steady on the nav station chart plotter while digging through the fridge or cupboards. Furler tack shackle: Opened at night and the sail bent it while it worked its way free. Fixed for now with a short spectra lashing. Plastic cleat on mast cracked. Not a big deal it is for the lazy jacks that aren’t currently installed. In the morning we finished organizing our storage lockers to make equipment that might be needed on passage accessible while non essential gear was stowed in the v-berth. We filled up our water tanks and checked over the boat. I discovered water in the bilge for the first time since we arrived in Hampton, fortunately I was able to trace it back to a flexible water jug that I had filled the night before, so the jug was discarded and the bilge cleaned. Mysterious water in a normally dry bilge is discomforting when you are just about to head out to sea. We had lunch and then cast off our lines and motored around to the fuel dock. At 14:00 we phoned in to clear out of US customs and set off. 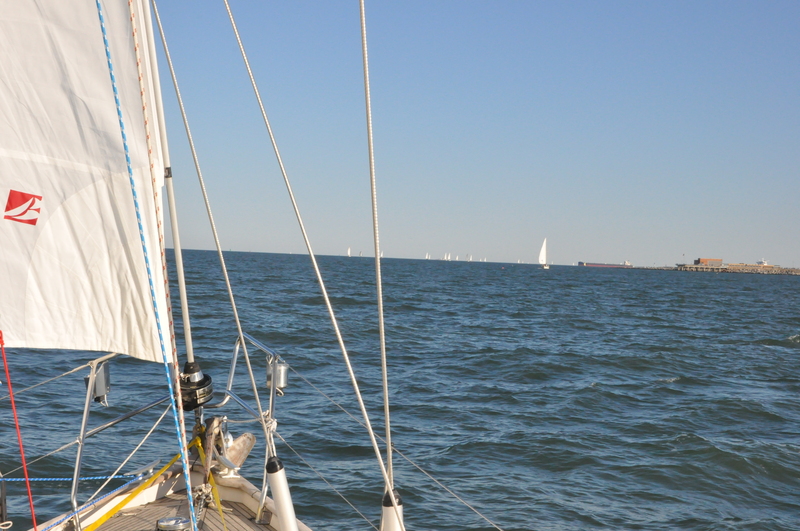 Once out of Hampton we raised the sails and motor sailed in very light winds out the auxillary channel to the open ocean. We passed about 50 yards from a sea turtle. As we exited the Chesapeake Bay the winds built to a comfortable level for sailing and we shut off the engine. We had a clear starry night and it was strange as it was the first time we had sailed at night with a lot of boats and we could see numerous white mast head lights ahead of us and red and green behind us. 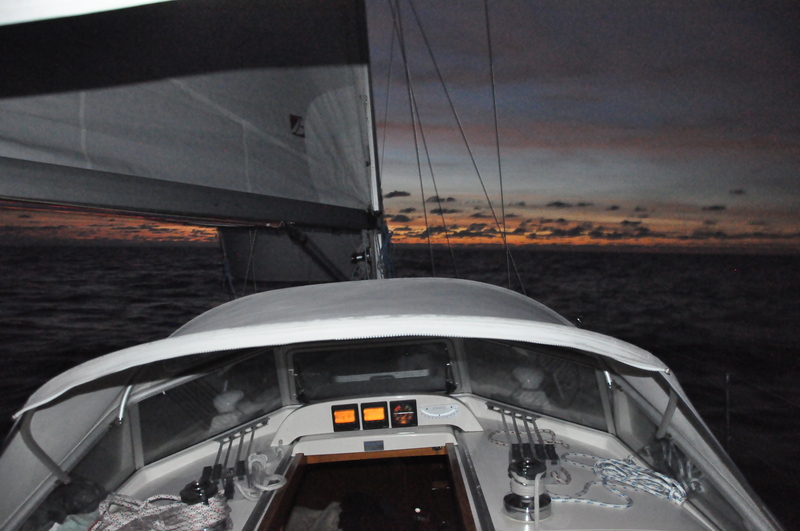 The first night we continually had about 8 boats showing up on our AIS system as we sailed in 15-18 knots of wind. The good sailing winds continued into the morning and we entered the gulf stream off of Cape Hatteras with 15-18 knots of wind. We watched the sea temperature climb rapidly from 17C to 24C and by the time we were in the middle of the stream we had a current of 3.5 knots with a set of 045, so we gained a little easterly boost as we crossed the stream. Mid afternoon, the rudder and wheel jerked abnormally on me and then a few seconds later a few dolphins surface on both sides of us. I imagine one of dolphins must have tried flirting with Altera by brushing into the rudder. By evening we were through the strongest part of the Gulf Stream and actually picked up a boost from an eddy current. Earlier in the day there were 5 boats within AIS range, now as the sun goes down we are down to just one and I can faintly make out a green navigation light on the horizon. By midnight the winds were fading, and I was hoping for a few more hours of sailing as early on in a passage I find it more difficult to sleep with the engine running. The winds continued to fall so we started the engine to motor sail. It had been 36 hours since we last ran the engine so the batteries were now down at 50% and needed a few hours of charging anyway. At 8am I was on watch motoring along when I noticed another boat ahead. It seemed to be close to a collision course so I kept a close eye on it and as I got closer I realized it was a sailboat with no sails up. As the winds were light this was not overly surprising, by we continued to get closer. Finally I was 200 yards away and realized it was an abandoned boat just drifting. We circled around and blasted our horn in case anyone was down below, but no response so we continued on and Chrissy called it in to the coast guard. We learned on arrival that the crew had been rescued over the weekend prior to our departure off of Cape Hatteras in the brutal gales that had delayed the departure of the rally. With the calm conditions I took the change to have a quick shower in the cockpit to freshen up and we had bbq chicken for dinner. 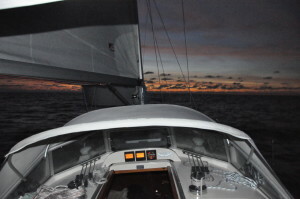 As night set in we had light SE winds 10-12 knots so we shut down the motor and resumed sailing through the night. The SE winds disappeared in the morning and we were again motoring for a few hours. 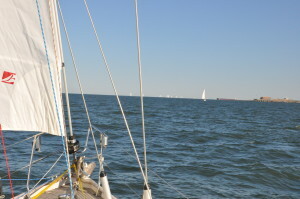 Then we had wind and sailed, followed later in the day by more motoring. We had a notable 5’ swell from the SE which was slowing down our progress as Altera tried to motor into it. Magnus has now adapted to life at sea and will do his business on the foredeck on command. The latest weather forecast suggest we will have some wind overnight and a bit on Friday, but Saturday and Sunday could be light. There is a building chance of easterly trade winds by Monday evening so Chris Parker, the weather router is suggesting we be prepared to motor east if the calm conditions do set in for Saturday and Sunday. We have wind again as of the early hours of the morning. The winds built to 20 knots from the SW with gusts higher and the seas quickly heaped up to 6-8 feet shortly after day break. We are flying along on a close reach hitting speeds of up to 8.5 knots. In the evening the winds subsided so I shook out a reef in the sail and 20 minutes later while Chrissy was listening into the weather update a front passed through clocking the winds around to the NW. This made for some slightly confused seas, but we progressed on and the winds shifted to the NE as the evening progressed falling to about 5-7 knots. The winds built to SE 15 knots so we were able to mostly follow a direct course to our destination by sailing on a tight close reach. On the morning watch I encountered several squalls. The first one tracked to my port side and I overheard a couple boats on the Caribbean 1500 rally asking each other how it looked on the radar. Visually it looked a lot worse to me than it did on the radar and I skirted the edge seeing gusts up to 24 knots. A few minutes later I heard one of the other boats hail his friend to let him know it was worse than it looked on his radar and his rail was now under water. The next squall I couldn’t avoid, but it was more rain than wind. This was welcome to rinse some of the salt off of Altera. When the rain squall hit Magnus looked at me and gave me the ‘your on your own look’ as he jumped down stairs and sat at the bottom of the companionway watching me. We have had steady winds now for 36 hours so our batteries are again due for a charge. I’m hoping the winds fall a bit as I don’t like running the engine when we are heeled over, and can hold off until tonight for a charge as we are offsetting our daytime power with the solar. Over night the winds shifted to SSE 15 knots so we are now sailing a tight reach heading mostly east. 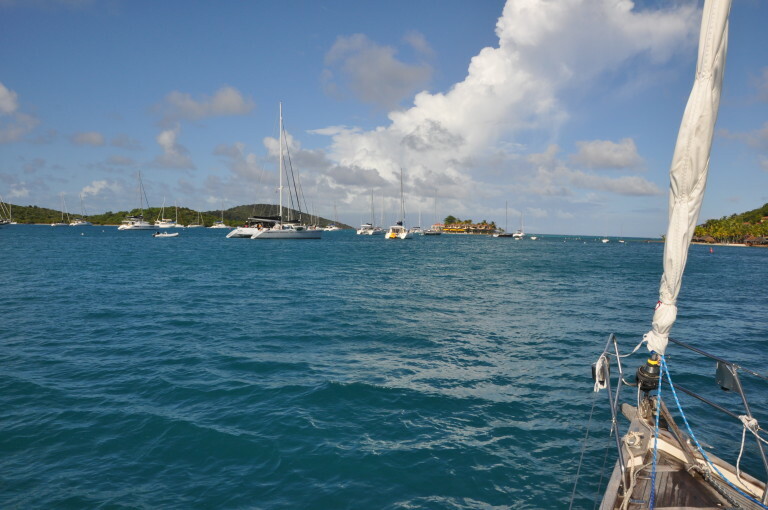 As the day progressed the winds built in excess of 20 knots and the waves were now pushing us on a North Easterly course, so our VMG (velocity made good) to the BVIs is now about zero. The winds clocked to the SW at about 15 knots by mid afternoon so we altered course heading SE again. 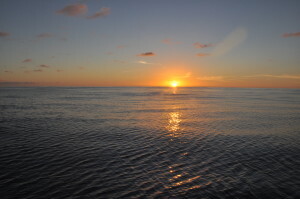 We are hoping for a favourable forecast at this point, preferably with a day of following winds and seas so that we have a more pleasant and less fatiguing motion as well as gain a boost from the waves instead of always fighting it. Unfortunately Altera’s hull is of a design that does pound upwind, albeit not as much as some flatter bottom boats, but this is becoming frustrating trying to make progress to windward without beating the boat up. As of 5 pm our trip log is showing 780 knots, so we should be just past the halfway point unless we get stuck battling Southerly winds. The winds faded this morning and again we needed to charge the batteries so we motor sailed until evening. I filled the diesel tank with 3 jerry cans, so we know we have a full tank plus 1 jerry can in reserve. The winds built just before dinner so we had to postpone our plans to bbq and opted for left over pasta instead. The winds this evening are allowing us to sail to our waypoint near Anegada and if the winds remain favourable we could arrive Friday. Overnight the winds strengthened and shifted from E to SE pushing us 30 degrees off course. There is now no chance we will make a Friday arrival, and mid morning Magnus, otherwise quite happy on the trip, gave me a look as if to say when is this going to be over, although I may have misinterpreted as soon thereafter I went hove-to to put in a reef and Magnus took the opportunity in the calmer motion of being hove-to do jump on the foredeck and relieve himself. He has since been his cheery self. The benefit of going upwind is that the deck was cleared of all evidence with a minute or two of resuming sailing. Probably the only part of the boat that is benefiting from this trip is the teak decks that are continually getting thoroughly rinsed with salt water. This morning I had to reef the headsail 3 times for squalls and then the winds sustained themselves so I put in the 2nd reef of the main sail as well. I am tired at this point and rather frustrated at the seemingly unending slog to windward. I spoke with another boat on the VHF and they too were suffering, having a racier shaped hull than us the pounding was worse and they described the feeling with the close hauled conditions and continually shifting winds to make their experience similar to having been put through a washing machine. In the early evening, our autopilot decided to call it quits too. We haven’t used it much on passage as we generally prefer hand steering, but do take advantage of it to go below and grab a snack, so we will miss this. I am now regretting not buying a tiller pilot to rig to our E-tiller to serve as a back up that can be used in light conditions and when motoring. The forecast is now excluding all possibility of the easterly trade winds until Saturday, but instead 2 days of almost completely calm conditions. I am glad we still have a healthy reserve of fuel. We had some of the strongest winds overnight that we have had for this passage, sustained at 22-24 knots giving apparent winds around 28 knots as we continue to battle upwind. Through the night we had been sailing with 2 reefs and a partly furled head sail. This would have been the ideal conditions to use our smaller jib, but the forecast had been for lighter winds so we hadn’t made the change the night before. In the wee hours of the morning the winds faded slightly and I rolled out the full jib. Shortly there after I heard a sail flogging and turned on my LED head lamp to investigate, to discover that the tack of the jib was now free flying. I called to Chrissy to wake up and come on deck to steer. With the tack loose I likely wouldn’t be able to furl the sail in. I went up on deck to investigate and discovered the snap shackle was bent. I suspect the shackle opened and was bent as the sail worked its way free. I scrambled back to the cockpit and grabbed a piece of spectra line and was able to lash the sail in place. I had drop the halyard a bit to make this possible and to feed about a foot of sail back into the luff groove of the furler foil. By the time this was done I was soaked from us plowing into waves, and Chrissy was able to return to bed while I continued sailing. By mid afternoon the winds had moderated to about 10 knots but were unfortunately from the SSE, so we progressed making slow progress. With the light winds and the current wave state making for effective tacking angles of 120 degrees after currents are factored in, the GPS arrival is for the 18th of November… Really hope conditions improve. 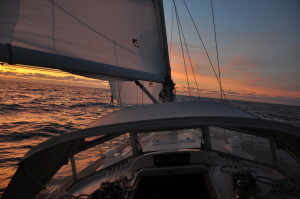 Over night the winds fell and we started motor sailing. By morning it was calm and the jib was furled as there was insufficient wind to keep it full. We kept the main sail up as it helped smooth the motion of the boat as we still an existing sea state. 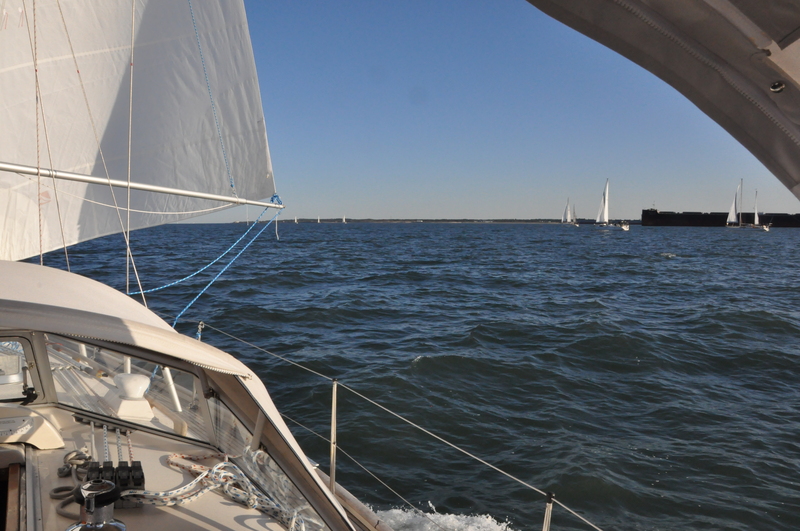 Later on that day the main sail came down as well as we motored on. With the seas calming down we were able to open all the hatches to get some much needed airflow through the otherwise sweltering cabin. Magnus spent most of the day panting heavily resting in the shade as we progressed through stagnant air. We finally had our bbq chicken. I am really glad I installed a blower fan to exhaust the hot engine room air, as such a long duration with the engine running would only be making the cabin temperature of already 31 degrees Celsius much worse. The light winds persisted through the day today, however we were able gain a slight boost at times from the sails. The light 5-7 knot breeze made the temperature in the cockpit much more pleasant and Magnus was his usual happy self. We reheated some left overs while cooking potatoes on the bbq to prevent any unnecessary heat sources in the cockpit. 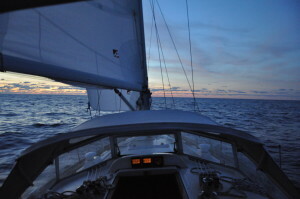 I took the helm around 4 am this morning and was soon able to see some faint lights on the horizon. It must be lights on Virgin Gorda, otherwise the GPS is way off and I am headed to the reefs on the east end of Anegada. As the sun came up it confirmed that the lights I had been seeing were in fact on Virgin Gorda as I could faintly see the land mass in the distance. It was actually a while later before I could see the low trees on the sand bar island Anegada, which is only 28’ feet above sea level so it isn’t visible from a distance. 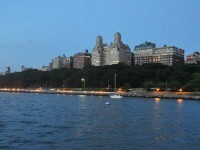 We had been motor sailing through the night, but the winds are sufficient to sail so I have shut off the motor. A few hours later as we rounded Anegada I started to see markers identifying crab pots, barely visible in the waves. I’ll have to keep a keen watch as I don’t really want to tangle one in my propeller. 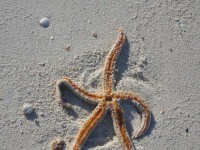 It might be time to take more of a liking to sea food, as perhaps this will minimize the frustrations with having to dodge them on a regular basis while we travel in this region. 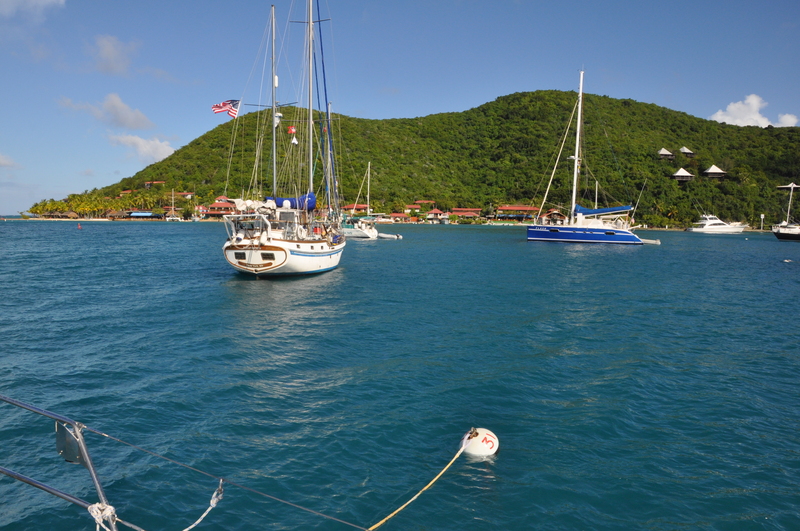 As we rounded Anegada, we had a little over 2 hours remaining with the brisk winds on our close hauled course to reach the entrance to the Gorda sound and the sailing conditions were pleasant. Half way there probably a dozen sails surfaced around us as the charter boats started their daily jump to a new port. As we approached the entrance to the Gorda sound a Lagoon catamaran was heading out and shouted over ‘nice boat’ as they recognized that we were not a charter boat. We turned and waved and realized this was the “Mama Cocha” the catamaran we had taken our intermediate cruising course on a few years ago! We made it uneventfully into the Gun Creek anchorage where the customs office is and dropped our anchor. I lugged the dinghy up from the V-berth and then the slatted floor and inflated it on the foredeck in the hot sun. Chrissy helped me heave it over the side and then we put the motor on and in my haste of exhaustion and dripping with sweat I must have only secured one of the oars as the next day I would realize one was missing. I hope our outboard runs well until I can get a replacement which may be a tall order for it as it has a bit of a personality. I freshened myself up and had a shave and then headed ashore with the boat papers and our passports to check in. Everything was routine, and then I was sent back to the boat for Magnus as we waited for the vet to arrive to verify that he was in deed healthy as per the stack of papers and tests that we had to have prior to arrival. The vet looked at him from a distance of about 6 feet, said he though he looked good and signed off the papers. We headed back to the boat, picked up the anchor and motored the last mile across the sound to the Bitter End Yacht club, where we have a free mooring until mid December if we choose as part of the perks of being in the Salty Dawg Rally. As we were organizing the boat that afternoon we heard a rumor of a happy hour at the Saba rock bar and enjoyed a couple painkillers for a reasonable $3.50. We shared a table with the crew from Strider, a couple who have taken a sabbatical to travel with their kids and enjoyed their company and had a meal as our fresh food situation on board was dismal and the sun was going down. We were dead tired now and looked at our watch to determine it was only 8pm. We dinghied back to Altera and were in in bed shortly afterwards for a well needed full night of sleep. Sounds like a nice experience. Now it is time to relax and enjoy. I agree with Barbara, time to rest, relax, and enjoy. You certainly got out of Penetang just in time….. 30- 50 cm of snow today and gusts to 75 km. Enjoy your stay and I look forward to following along while we freeze up here. So glad you are there safely! Very interesting reading about your sail there!! What an experience! As I look out the window here it is like a blizzard with high winds, snow and closed roads. Relax and have a wonderful rest in the sun and warmth! What a trip you guys are having. We’re just back from Jamaica Mon. No we’re freezing you know what! Take care, enjoy. Thanks for following, Hope jamaica was fun. Unfortunately we can’t sail there with the dog. ” Pain Killers ” at Saba Rock. Your killing us up here! LOL. We have around a foot of snow is on the front lawn since yesterday! Glad to hear you had a safe trip down from Hampton Roads. Now you guys can really slow down and enjoy. Love the updates. We look forward to them. We have a spare cabin if the snow becomes too much to bear! Was wondering how things were going as it had been a while since you last popped around UW. Assumed it was all good news. Glad to hear that you are working on your tan while enjoying various rum enhanced concoctions! Looking forward to lots of lush green vegetation in upcoming photos. I’ll do my best to capture some great photos. I need to start doing a better job of bringing the camera along. It will be a while before I randomly pop into UW again though.